12.25 p.m. R1 8 Captain Risky (3 g Rip Van Winkle – Dreamworks, by Maroof) – Jordan Grob (a2); kept finding the line with a respectable effort for eighth after being caught wide in the Maiden 1600 metres on 8 April at Pukekohe, after staying on behind subsequent smart win Not Usual Talent (Zacinto) in the Maiden 1400 metres on 16 March at Te Aroha. 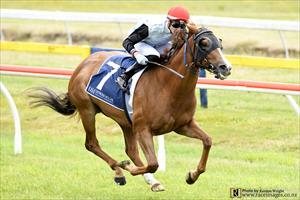 Drawn to receive an economical trip from barrier two in the $10,000 Maiden 1600 metres, he can finish closer. Fixed odds: $31.00 & $6.50. 3.52 p.m. R7 1 Ali Baba (5 g Savabeel – Dreamworks, by Maroof) – Jordan Grob (a2); drops back in grade to resume off 81 days in the $22,500 Rating 65 1600 metres. Schooling in preparation for jumping assignments, he has been competitive in stronger fields and previously acted boldly when fresh in condition. Fixed odds: $7.50 & $2.30.